Clad in a dirty white T-Shirt emblazoned with the face of a glum Emmerson Mnangagwa, an illegal gold miner sifts through brownish wet sands and points out to a group of journalists, “this is gold”. It is a gold rush of some sort which cannot be stopped by once dreaded former president Robert Mugabe — a man whom they once deified but now have little respect for since his dethronement by President Emmerson Mnangagwa in a soft-coup last November. The farm is called Smithfield, the owners are none other than the Mugabes — Robert and his once politically powerful and influential wife Grace, and the unwanted visitors are artisanal miners who have invaded the flourishing citrus plantation in Mazowe. The invaders’ ages vary — from the teens to the grey-haired ones. How things change. Tables have turned. There is a new sheriff in town. After ruling for a long 37 years, it was unimaginable that one day, the same people who helped maintain his stranglehold on Zimbabwe, would turn against him. Old Mugabe is angry at his former allies, whom he regards as the reincarnation of the much-vilified Judas Iscariot — that biblical character who betrayed Jesus for a few pieces of silver. But it’s not silver that the 60-plus men are digging for, it’s gold. And they vow to continue digging and digging — scarring the environment and threatening the healthy, beautiful citrus shrubs, and destroying irrigation equipment worth thousands of dollars in the process. “We don’t care,” they say. Just like everybody is feeling the pain of the tough going in Zimbabwe, the miners too have to eke out a living in order to silence the rumblings in their stomachs. “We have families. We are Zimbabweans and we will not leave unless if the president (Mnangagwa) says we should,” an illegal miner with a face plastered with dirt and bloodshot eyes says. “We are not scared of anyone but the president, and the police are no match,” he said. “The police lost authority when Mugabe was removed, so unless the army steps in, we will not move, Grace herself has been here and we have told her that she is no longer the first lady,” the miner said, adding “we now have Auxilia (Mnangagwa’s wife). “After all, the president has told us that Zimbabwe is open for business and this is the business that we are doing”. As he speaks, a man who identifies himself as the owner of the mine claim, one Wastemore Kadungure, comes through and waves a discoloured white paper which he claims is proof of ownership of the mine claims. “We are here from all over Zimbabwe, some are coming from as far as Bulawayo and the reason is because the mine is ours. “I am a member of Zanu PF and unless the president himself says we should leave, then I will not move, let them not mislead the world saying that we are illegal miners — this is our land and Grace was using her powers to take what belonged to us,” Kadungure said. He claimed his uncle was once Mugabe’s bodyguard and therefore there is no reason for him to dislike the former president, but then he believes in justice. “It is my mine that I got around 2002 but was forced to leave by Grace when she was the first lady. Now that she is gone, I am back to claim what is mine,” said Kadungure. Although mining licences are renewed on an annual basis, Kadungure’s letter is dated September 2012. When she made her police report last month after the miners settled on the farm, Grace pointed out that her properties had been invaded and she asked for police’s intervention. “I then asked them to stop their activities since I am the owner of the farm and I am the holder of a special grant for the whole area. “However, the crowd, led by one known as Nyasvingo, started to shout obscenities at me and continued with their illegal activities. “The illegal activities have since destroyed my irrigation infrastructure which feeds the lemon section, and there is massive land degradation. “The activities also pose a threat to my children’s home as the illegal panners are also seen loitering inside the home at night...I then proceeded to Mazowe Police Station and made a report,” said Grace in her police statement. Stripped of power, Grace now fears she might be stripped of her properties and rhetorically asked reporters whether Mnangagwa would like to be treated the same way, if ever he loses power. “Can you please leave this place because it is private property,” Grace told the mob, which however, shot back saying “you are no longer in power and you cannot do anything to us”. Later, she asked reporters: “does it mean that if...Mnangagwa is removed tomorrow he will be stripped of his investments. Mnangagwa has not yet answered, but his Home Affairs minister Obert Mpofu has, labelling Grace a liar. “The Zimbabwe Republic Police attended the scene on March 30 and 31, 2018 and established through interviews and physical checks that there were no illegal miners at the children’s home and lemon plantations,” said Mpofu. Another syndicate of miners led by one Shepherd Nyasvingo has withdrawn its case challenging the former first family’s ownership of the disputed mine. According to court documents, Nyasvingo, Bright Mawonga and Mohammed Rezwani Khan withdrew their case against Gushungo Holdings (Gushungo) on March 26. “Please take notice that applicants hereby withdraw their urgent chamber application against 2nd respondent (Gushungo) and will tender wasted costs”. A lawyer representing the former first family, Walter Chivore, told reporters that he feels that his clients are being victimised but put faith in the country’s legal system to interpret the law fairly and without favour. According to Chivore, the initial judgment against Gushungo was rendered in default and they later challenged it indicating that they had not been served with requisite papers. “The record on the High Court consists the answering affidavit and opposing affidavit and materially in response to the applicant, Gushungo Holdings is arguing that it has special grand on the 6- hectare property, while the applicants argued they had a certificate of inspection,” Chivore said. The Harare-based lawyer said the former first family, which has a mining certificate issued in 2016, has right to the property and minerals underground. “On the 26th of March, the applicants filed a notice of withdrawal against Gushungo Holdings. According to the panners, they are now reaping the fruits of a new Zimbabwe, after the removal of Mugabe following a military orchestrated “soft coup” that resulted in Mnangagwa ascending to the coveted presidency. “This is the indigenisation that ... Mugabe introduced. We are indigenous people and should be allowed to mine. “All of us here are Zanu PF supporters and we are here to eke a living,” said on of the miners. According to the miners, Grace cannot lay claim to Smithfield since she also owns Iron Mask that lies across the road. And contrary to claims by Mpofu that they have been on the disputed site before Grace’s intrusion, Kanengoni admitted they only came after Mugabe’s fall. A fortnight ago, Grace confronted the illegal artisanal miners who have invaded her farm that also houses an orphanage and swiftly proceeded to make a police report after the invaders had told her she was no longer in power and could do nothing to them. However, undeterred by the presence of the menacing miners who were waving shovels and machetes Grace told them to leave the property but they would not budge. 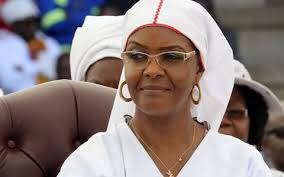 The former first lady then dared the farm invaders to attack her but none made a move only murmuring before busting into the song “Kutonga Kwaro” a piece by contemporary musician Jah Prayah that was, last November, the sound track song of the soft coup that led to the downfall of Mugabe. With only skeletal security, after the State stripped her of “bodyguards”, Grace then made a police report in the company of her nephew—who is now some sort of her close bodyguard. Since reports surfaced that Mugabe is backing the National Patriotic Front (NPA) led by retired army general Ambrose Mutinhiri a party which is linked to expelled and former Zanu PF officials, the former first family has been subjected to unrestrained attacks by his erstwhile comrades with some even threatening to expel the former strongman from the party he founded along with other nationalists in 1963. Although Mugabe has indicated a willingness to engage with his protégé turned tormentor — he has been insistent that the present administration under Mnangagwa is in power “illegally” and that he is not happy. Mugabe has said his family is being harassed while workers are subjected to interrogations from alleged State security agents.